Sarah (Chelsey Crisp, “Fresh Off the Boat”) and Matt (Michael Steger, “90210”) have moved into a big house in the country. Sarah is pregnant and the couple hopes to raise their new family away from the city. They’ve invited their friends Bree and Dave out to the new house to celebrate. Sarah’s estranged twin brother Eric and his girlfriend Skye crash the housewarming party, and they convince the group to spend the evening ghost hunting in the nearby ruins of a burned-out prison. 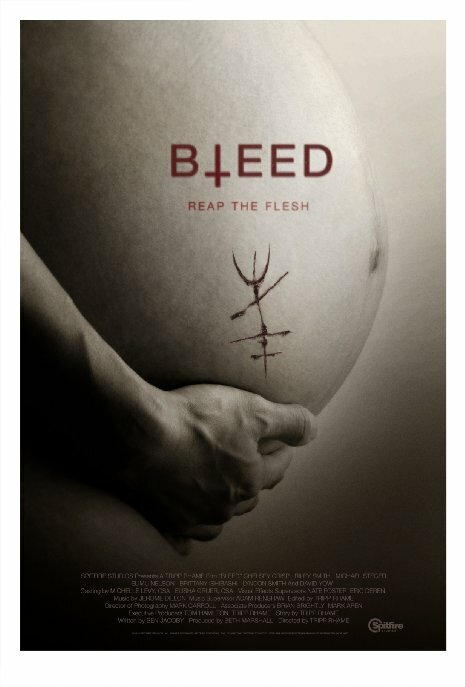 Bleed is the first feature film from writer/director Tripp Rhame (also a first for co-writer Ben Jacoby). The filmmakers were wise to surround themselves with veteran actors who do a good job of bringing to life an otherwise middling screenplay. Crisp and cast elevate a run of the mill straight-to-video offering to something better; a film that successfully creates a spooky remote atmosphere. In the first act, Sarah has a blow out on a lonely country road and a squirrelly small-town deputy comes along to help her change her tire. Actor Mark Ashworth plays the deputy and his performance is a stand out. I would have really enjoyed seeing much more of him and was disappointed that he didn’t have a larger role to play. Much of the film features subtle makeup effects that work beautifully, without drawing too much attention to them. The digital visual effects, however, cheapened some scenes they were intended to enhance. These moments weren’t terrible or jarring, but some unneeded bigger visual moments were attempted that didn’t particularly benefit the end product. Bleed shines more during its more atmospheric and simpler moments. The film’s runtime is only 80 minutes, yet it drags a little in places. Bleed is an above average ghost story thanks to its cast and overall emphasis on creating a realistic environment populated by believable characters. Synopsis: It seemed perfect – a new house, a new marriage, a child soon to be born. But when Sarah and Matt invite their friends to celebrate, the situation turns deadly as they enter a burned-out prison on a ghost hunt. As the six friends encounter horrors of this world and beyond, no one is safe – not even the unborn. Previous Post Where did Cloverfield Come From? And Where is it Going?